About the baking temperature. The first 10 minutes I bake the cake at 350 degrees F/180 degrees C, then I turn the oven temperature down to 200 degrees F to 225 degrees F/93 degrees C to 107 degrees C and bake another 25 to 30 minutes. It will take some time but you will get a nice eggless cake. If you bake this cake (as baking a cake with eggs) at 350 degrees F/180 degrees C for 35 to 45 minutes then this cake looks like its baked but you will get a unbaked lumpy cake. So don't worry. Eggless cakes are little tricky, without eggs we need to be patient while baking. 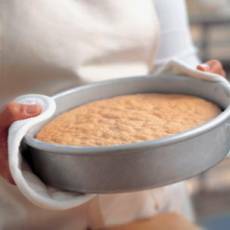 Preheat oven to 350 degrees F/180 degrees C. Grease 2 (9-inch) round cake pans. Sieve together the flour, baking powder and baking soda. In a large bowl pour sweetened condensed milk, butter, extract and beat well until smooth, then add milk and soda water. Mix it well and add flour mixture spoonful by spoonful into the mixture. Beat it gently until smooth. Pour batter into prepared cake pans. Bake in preheated oven for 10 minutes and then reduce the oven temperature to 200-225 degrees F/93 to 107 degrees C, and bake for an additional 25-30 minutes (insert a toothpick or skewer in center of cakes after 25 minutes to check to see if cakes are done). Cake can be kept refrigerated for up to one week. Makes 2 (9-inch) cake layers. Thank you! Thank you so much..you have no idea how much your tip of decreasing the temperature has helped me..I baked my first perfect eggless cake thanks to your amazing tip..thank you so much!!!! I loved it being vegan. Hi Nitu, could you please tell me what shelf (ie. top/ middle/ bottom) you put the cake tins on? Thank you!